A Hoover vacuum cleaner, regardless of design, pushes air through hoses and filters in order to create suction. A Hoover WindTunnel bagless model making a loud noise while turned on requires troubleshooting to determine the cause. A few household supplies are needed. 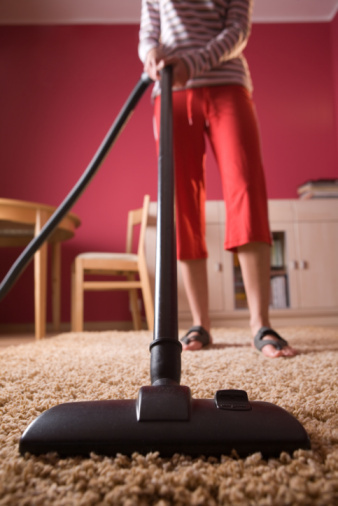 Unplug the Hoover WindTunnel bagless vacuum cleaner's power cord from the wall outlet if necessary. Release the latch on the side of the cover lid. Open the cover lid. Twist the hose inside the vacuum cleaner off the socket while pulling it straight out. Moisten a paper towel with water. Insert an edge of the paper towel into the end of the hose. Twist the towel clockwise as you rotate it inside the hose. Remove the towel and any loose dust balls and other contaminants that were stuck in the hose causing the noise. Reattach the hose to the socket. Close the cover lid and reengage the latch. 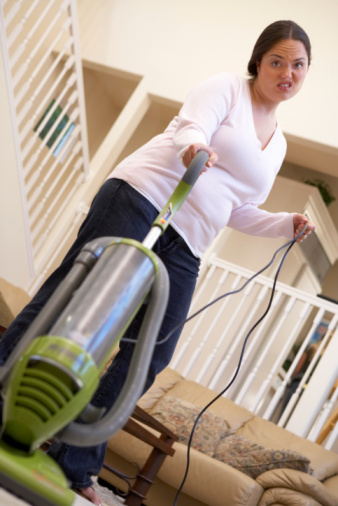 Unplug the Hoover vacuum cleaner's power cord from the AC outlet if necessary. Remove the screws from the back at the bottom of the vacuum cleaner using a Phillips jeweler's screwdriver. Remove the screws holding the panel on the back bottom of the vacuum cleaner with the Phillips jeweler's screwdriver. Pull the panel off. Use your fingers to pull the motor filter insert out. Wash the filter with water to dislodge dirt, dust and any carpet fibers that are clogging the filter and causing noise. Let the filter dry thoroughly before reinserting it into the compartment on the back bottom of the vacuum cleaner. Place the panel back on and reattach the screws. Twist the hose off the socket on the outside of the Hoover vacuum cleaner. Straighten the hose with your fingers. Hold the hose vertically. Place a sheet of newspaper on the floor beneath the bottom of the hose. Insert a ruler into the top of the hose. Remove the ruler from the bottom of the hose. Reach into the bottom of the hose and pull out the loose dust, carpet fibers and other contaminants that have gotten stuck in the hose and are causing noise. Reattach the hose to the vacuum cleaner. Dispose of the newspaper. What Size Is a Garden Hose Connector?